I’ve been making pasta for awhile now, and each time I get better. I’ve picked up a few tips, and was able to apply them in my latest batch, which was my best-looking yet! And for those of you scared by making it, I will say that practice helps. Plus, once you get the steps down, you not only feel more confident, but I’ve noticed that I make better batches of dough that are easier to work with. You might make a few mistakes at first, and the pasta might not look that great, but it usually is still tasty. On this blog, I have many posts about making pasta. I have even offered some tips, but this is where I want to include the major ones all together. 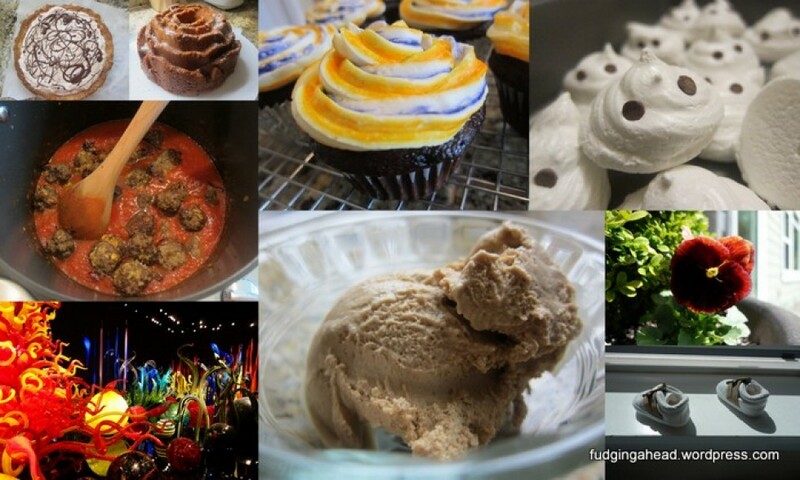 Plus, I promised a recipe, so you will get that, too! Have plenty of flour readily available. You will want it for your rolling surface, for the pasta if it gets sticky (it will), for your hands, for your rolling pin, and for after you cut the pasta to keep it from sticking to itself. If you have a marble board or countertop that is on the cool side, like granite, definitely make use of it. It is messier than other options, but has helped me have better dough. Laminate your dough! As you crank it through your machine and make it thinner and thinner, you want to do a process called laminating your dough. Basically, you take the strip and fold it in thirds like a letter. Then, take your rolling pin and roll perpendicular to your folds. This smooths it out again to go back through the machine. Laminating helped my dough become much smoother and less likely to tear. 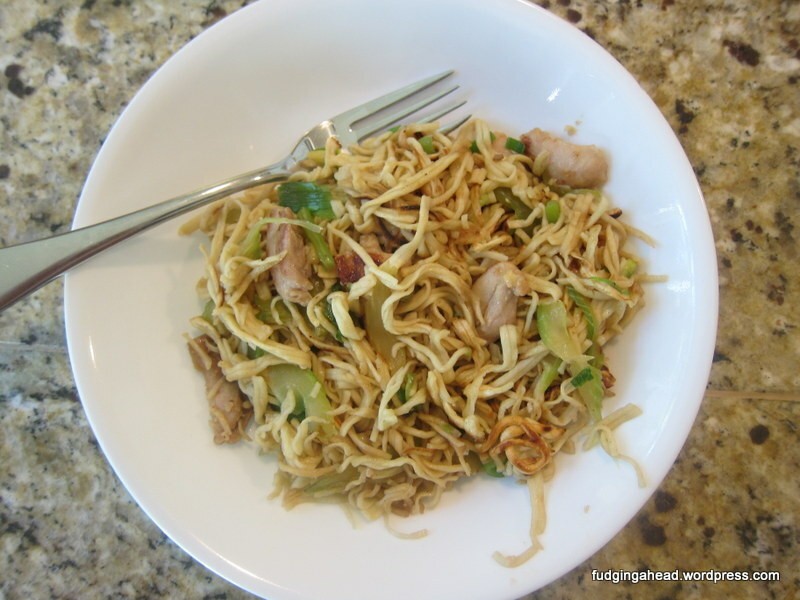 In case you noticed that I tagged this in my “Learning to Cook for Three” category, it’s because while I made the noodles, K cooked them using some tips from his mom and his awesome stir-frying abilities. It was fun being able to combine our expertise to make something so delicious. 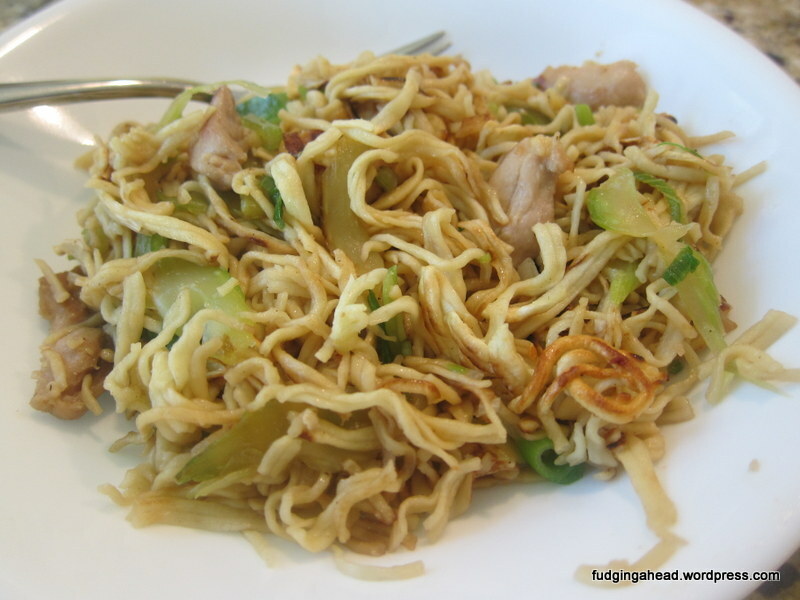 Even better, the Fudgelet loved the noodles, too! It was the first time he really liked pasta, which made me feel great since I had made them (and K cooked them to perfection!). Whisk together the flour, baking soda, and salt in a large bowl. 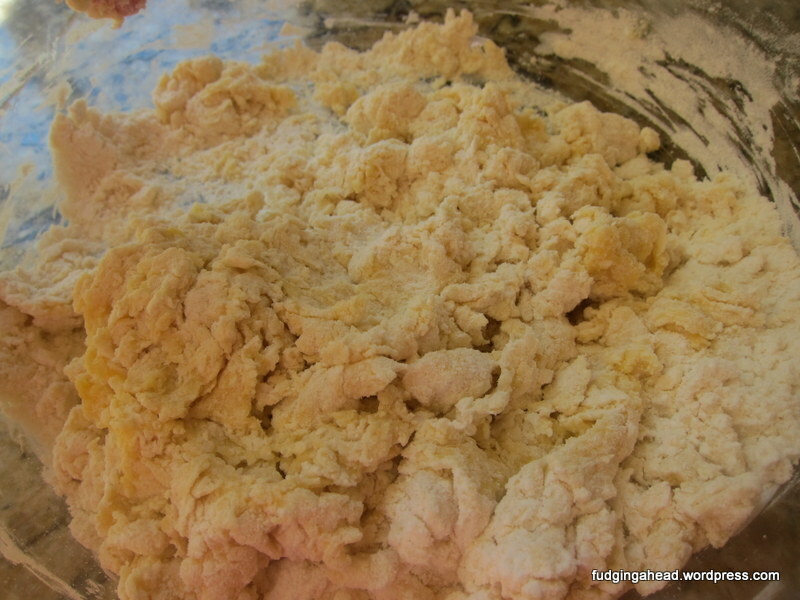 Make a well in the center, add the eggs, then use a fork to slowly mix the eggs into the flour mixture. The dough should come together and form a rough ball. Sprinkle a work surface with a bit of cornstarch and flour. Knead the dough on this surface until it becomes soft and mostly smooth (about 5-10 minutes). Let it rest for 20 minutes, covered in plastic wrap. Roll it out with a machine and cut into noodles. 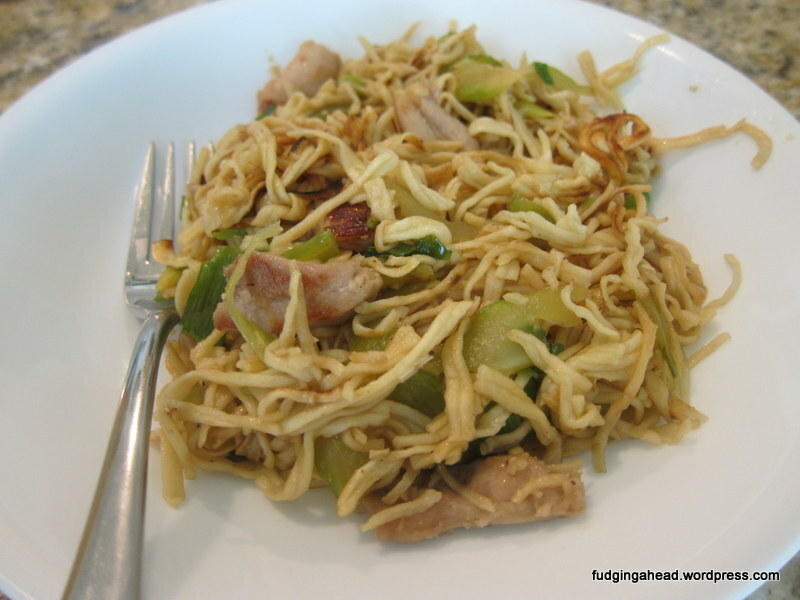 Toss the noodles with a bit more cornstarch and flour to keep them from sticking to each other. To cook, bring a large pot of water to a boil. Add some salt to the pot, then add the noodles and cook for about 15 seconds. Turn off the heat, and run cold water into the pot. Then, drain the noodles, return to the pot, and repeat the cold water and draining. Allow them to dry for about 1.5 hours until completely dry. You can cut them into shorter pieces to stir-fry them, or stir-fry them as is. Stir-frying them with a bit of sugar, soy sauce, ginger, green onions, and a protein is delicious! Whisk together the flour, baking soda, and salt in a large bowl. 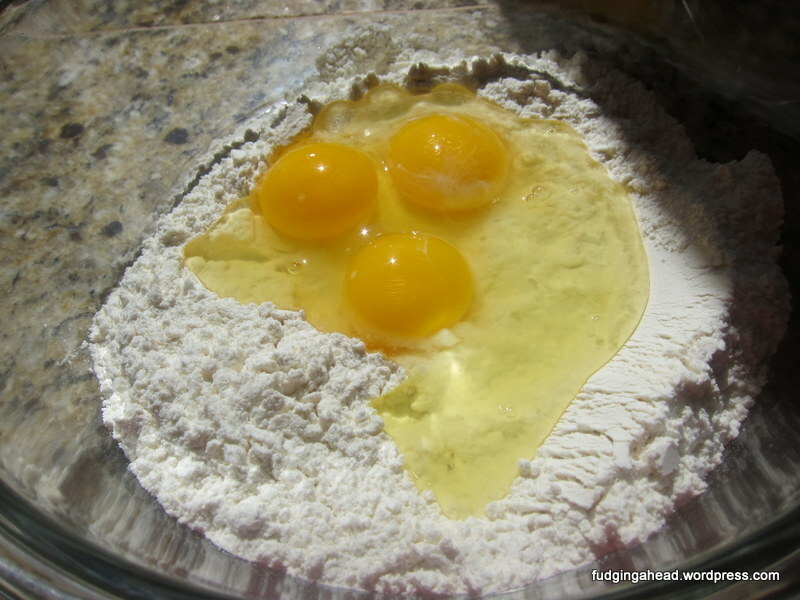 Make a well in the center, add the eggs, then use a fork to slowly mix the eggs into the flour mixture. 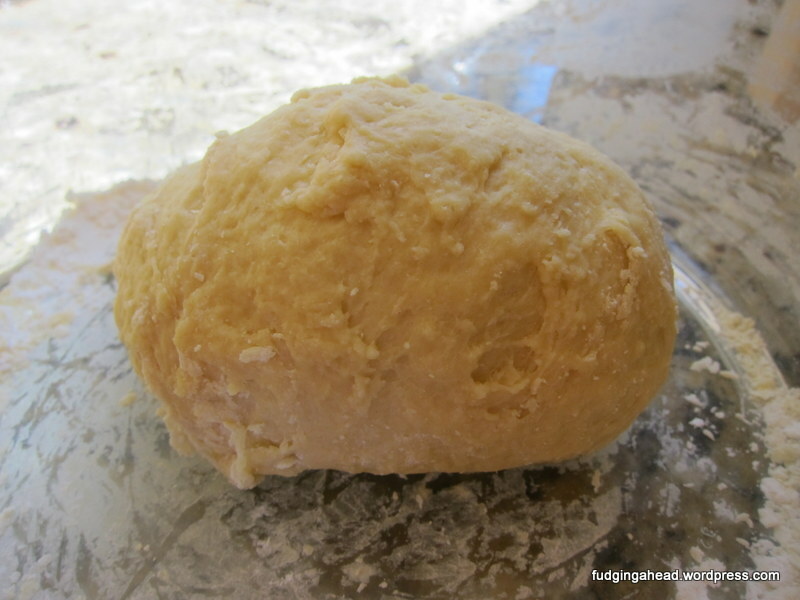 The dough should come together and form a rough ball. Sprinkle a work surface with a bit of cornstarch and flour. Knead the dough on this surface until it becomes soft and mostly smooth (about 5-10 minutes). Let it rest for 20 minutes, covered in plastic wrap. To cook, bring a large pot of water to a boil. Add some salt to the pot, then add the noodles and cook for about 15 seconds. Turn off the heat, and run cold water into the pot. 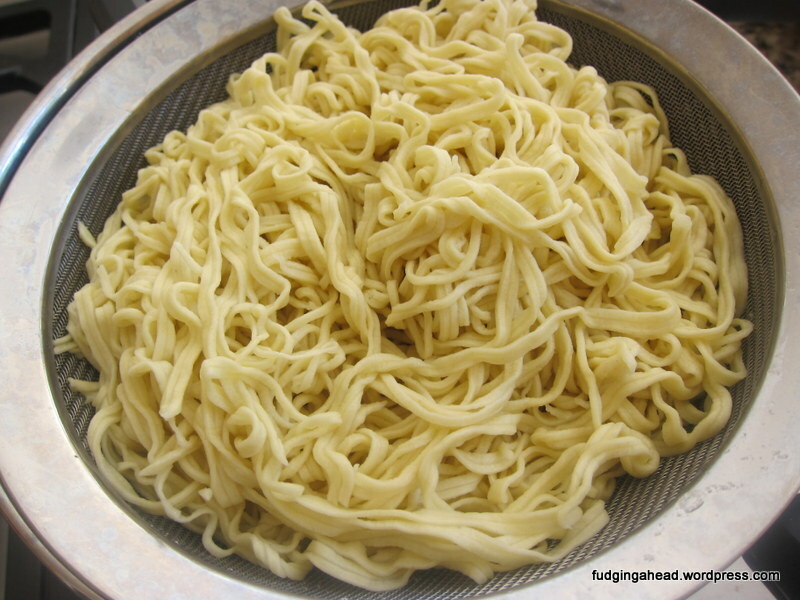 Then, drain the noodles, return to the pot, and repeat the cold water and draining. Allow them to dry for about 1.5 hours until completely dry. You can cut them into shorter pieces to stir-fry them, or stir-fry them as is. Stir-frying them with a bit of sugar, soy sauce, ginger, green onions, and a protein is delicious!